Photo courtesy of Ian Bennett. -Hello, room service? My fish has no head! – How does it smell, sir? Mr Netanyahu, we’re looking at you! Who’s been giving head to a fish? How’s the fish, well its been dead for days. So that’s what the fish said to the man in the tux. I don’t think it smells like a tulip. Interesting, is this a figure of speech in English ? In German, it is “Der Fisch stinkt from Kopf” and it means something like a chaotic hierarchy where the boss at the top makes the life of everybody else miserable. @Conventi: There is a version of this in English, and also a Yiddish version, apparently. I read where it was used to refer to Israeli PM Netanyahu on at least one occasion, and here it’s in a hotel in an Arab country. I see a possible link. So long and thanks for all the fish heads. Perhaps a case of deep trouting ? Arabic marketing is just SO appetizing. Some very old languages have lots of quotations especially ancient Arabic, so too Kiswahili. Which derived from ancient Arabic.. It is a language widely spoken on the east coast of Africa. They have a book of quotes called the Kanga. In fact that long wrap which the ladies wear, is oft’ festooned with quotes from the venerable book. Fadihla za punda ni mateke. = A donkey repays a favour with a myriad of kicks. thus: It hurts to be critisized, when you were trying to help. BTW. Kiswahili means similar to Fa’sa’amoa. One fish, two fish, bad fish, EWWW! fish. Maybe it’s a Suckher Fish. I don’t know if you’ve ever heard of Dr. Demento’s radio show, but that is where I heard the song years ago. 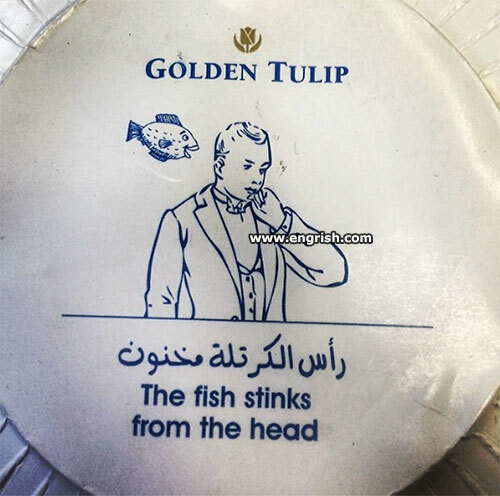 Otherwise your head stinks in the fish.